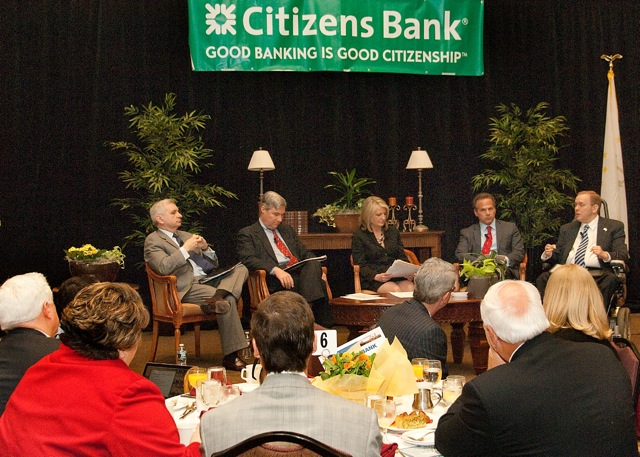 The topics ranged from investing in innovation to foreign affairs, and transportation infrastructure, when the entire Rhode Island delegation took the stage at the Greater Providence Chamber of Commerce’s 2012 Congressional Breakfast, held Monday, April 9 at the Crown Plaza in Warwick. Senator Jack Reed and Sheldon Whitehouse as well as Congressman Jim Langevin and David Cicilline answered questions posed by Chamber President Laurie White. The event, which attracted an audience of 500 local business professionals, kicked off with the demonstration of a new technology being developed by 121Nexus, a participant in the current class of the Betaspring incubator program. The new software system, linked to distributed QR codes, is designed to drive visitor engagement. 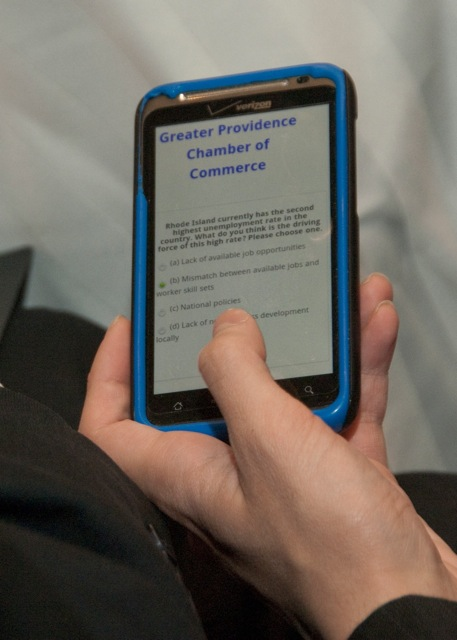 At this morning’s forum it was used to encourage event attendees to take a quick online poll about the drivers on Rhode Island’s unemployment rate using their mobile device. The delegation was the asked to comment on the real time result. Unemployment – We need to put Rhode Islanders back to work. That means investing in innovation, advanced manufacturing, science and technology. We need to address the skills training gap and we need to see improvement in the housing market ( 1 in 4 Rhode Islanders are underwater or close to underwater in their mortgage). Transportation funding – There is a sense of urgency in getting a permanent and predictable transportation program passed by both the House and Senate. Rhode Island summer construction jobs and deteriorating infrastructure are dependent upon it. Gas prices –– Oil Supplies are up and demand is down, yet prices are still skyrocketing. More needs to be done to understand and address this issue. To see highlights of this morning’s dialogue check out the #provcb on Twitter. Thank you to Senators Reed and Whitehouse and Congressmen Langevin and Cicilline for participating in this morning’s important discussion.